There's a few mods I never released here for some reason or others. I decided that now since Creation Kit was out for Skyrim and I might spend most of my free time trying to make mod for it now, maybe I should go ahead and finally post them here. I also created a new blog which I will use to post mods I make for Skyrim. This way there will be less confusion. Ragnarok Online was my first, and favorite MMO and this hat was inspired by it. I wanted to make many Ragnarok hats for Oblivion, but I finally never got to. This one was extremly easy. 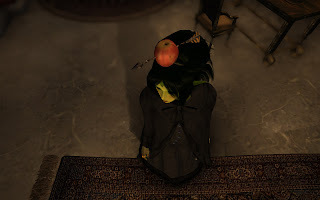 All I had to do was to extract an apple and an arrow from Oblivion BSA, and put them together. Babydoll Costume was a port from Fallout New Vegas. Mai originally pointed to it while looking for outfits for a character, and I decided to bring it in Oblivion. Porting it was fairly easy except I had little trouble with the sword. It was my first time porting weapon in Oblivion. I contacted the author on nexus for authorization but I never had a reply. All credits goes to him. Instruction and information about author are in readme file. 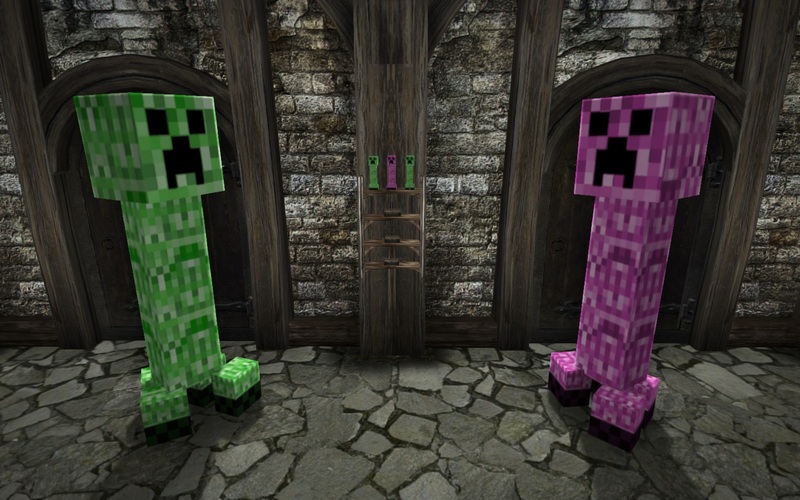 Creeper outfit were because I wanted to test weight painting by hand. To understand how it really worked when applied to different body part. I needed something simple enough and thought creeper would be funny. I eventually made a pink one too and also created smaller version for ground objects. There's about 500 of them, or more, in small boxes. They're located in testinghall. You cannot really miss them. 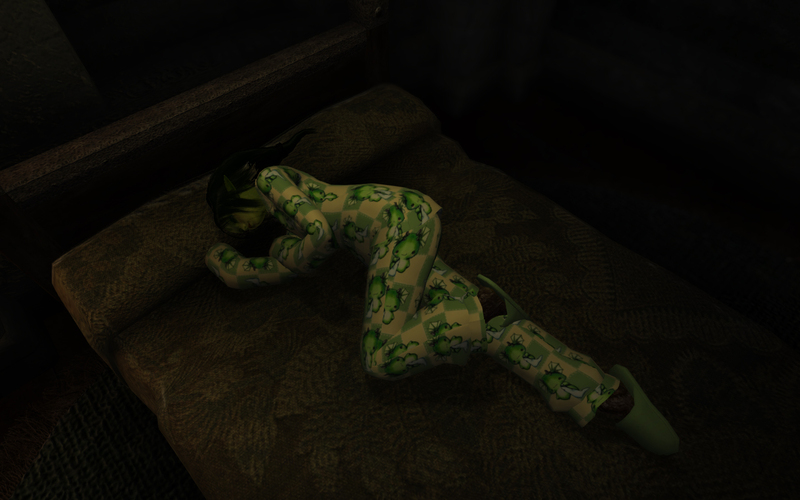 15 Cute Pajama's retextures including Dark Brotherhood, Daedric, mud crab, cute dragons, hello kitty and more, for hepsy's pajamas. I made these about a week or two before skyrim release. We wanted dragon pajamas for Skyrim. I started with one and ended with fifteen. Link to original mod and instruction can be found in readme. This one was a request from an Anon on /v/. He wanted Gizmodian's Netherweave dress for HGEC A-cup. There's nothing else to say if it's not that credits goes to Gizmodian. I love Nox in Wakfu anime series and I really like his clock needle sword. So I tried replicating it for Oblivion. I don't think it look that good though. Im thinking of making a new one for Skyrim sometime, when I figure out how to import weapons at least. There's two of them (1 and 2 handed) located in a box Testinghall. Pre-war outfit was made by Q-ta for fallout. I think someone requested it for Oblivion on /v/, but I'm not sure. I know a few people liked it pretty much though, myself included. All infos can be found in readme. Red Kawaii is a small race I created quickly out of Lavender Uguu made by Eiries and Honey Vanity. A few people didn't love purple and someone suggested I make a red version. I personally prefer lavender one, but I think this one is also pretty cute. 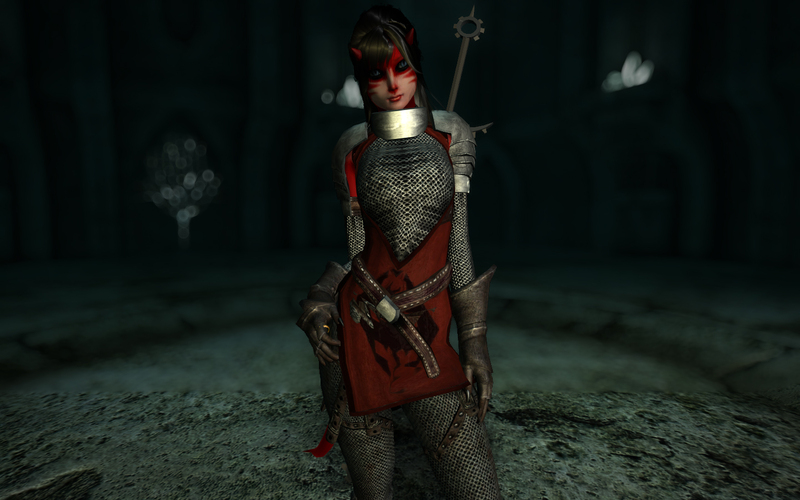 She uses horns from Kaleen mod and nails are from on of slof's mod. I edited Argonian tail in blender to make a pointy tip. I found out later that there was another mod with a pointy tail on nexus, but I'm glad I made this one myself anyway. Last one is a TGND refit of YAARM and sexier fur armor. I think it was a request again, but maybe not. REALLY late comment but what was the armor in the photo for red kawaii?? ?